HSBC Starbucks Rewards promo is back. Spend at least P2,500 and earn bonus points to redeem a tall Starbucks handcrafted beverage plus one add on or a 3-pack Starbucks VIA Ready Brew. You can use only one (1) charge slip issued by a merchant on a given day. You can choose to upsize your drink for only P15-P30. 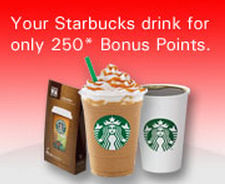 Only bonus points earned from your new spend is eligible for a Starbucks beverage. Existing bonus points may not be used.